Narrative: Letter was found by the donor among papers of the South Shore Ship Modellers Guild. The Acadia Gas Engines Company was formed on October 13, 1908 by W.T. Ritcey. The company was located at south King Street. They manufactured make and break marine engines, lobster hoists, 2 and 4 cycle engines and Waukesha Hesselman Oil engines. By 1918, it had become the largest manufacturer of two cycle gas engines in Canada. The company employed nearly 100 hundred men and at the height of production manufactured 2,400 gas engines per year. By 1941, the company had dealers and agents across Canada, Newfoundland and the far north. W.T. Ritcey died in 1946. The company continued until 1966 when it was sold to the Grimsby Group of Canada. It was then purchased in 1968 by the Atlantic Bridge Company Limited and in 1977, the name changed to ABCO Acadia. The last casting of the foundry was made in March 1984. The property and buildings were eventually sold and torn down, except for a building on the opposite side of the property which was developed into a condominium. In 1998, the Town developed the former Acadia Gas Engines site on the river side and officially opened Shipyard Landing park. Description: Ivory and blue typewritten letter on Acadia Gas Engines letterhead from A. S. Forbes, Sales Engineer to J. McAllister, Saint John, New Brunswick regarding literature on the 2-cycle Make & Break Engine. 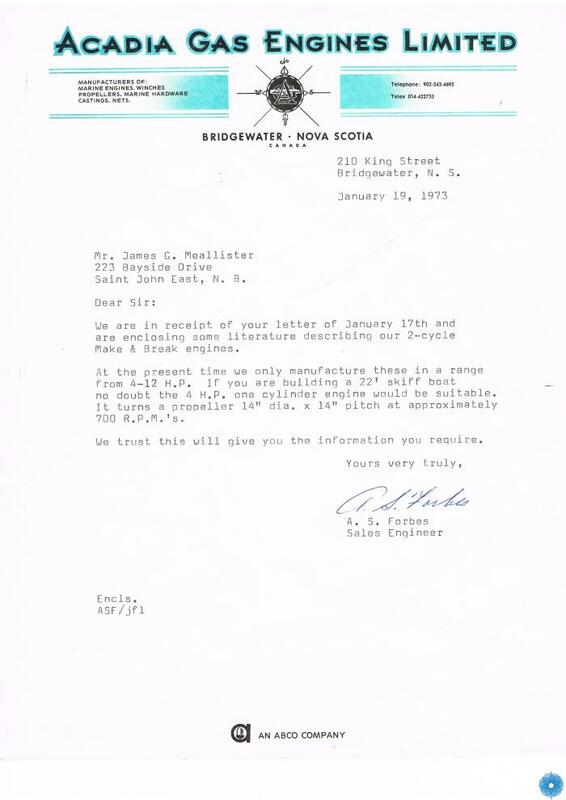 Acadia Gas Engines Limited, Bridgewater logo at top of paper. ABCO logo at the bottom of the page. History of Use: Used to send correspondence between two parties.